I joined TFS at the end of 2017. My degree is a BSc (Hons) in biological sciences/botany and I have a PGCE teaching qualification. Previous to starting work at TFS, I taught science and mathematics for over 20 years in the UK and Egypt – where I was responsible for setting up a new teaching laboratory – while raising my three sons. I am responsible for testing and analysing customers’ thermal oil in our dedicated in-house laboratory, in order to identify its key parameters so that TFS can recommend and conduct the necessary remedial work to enable their thermal fluid systems to operate efficiently and safely. This is part of TFS’ HTfluidfit health offer. Thermal fluids degrade over time and this causes loss of thermal efficiency, flashpoint reduction, mechanical failure and ultimately, system downtime and associated cost. It is a legal requirement to maintain minimum flashpoints. TFS provides a continuous thermal fluid risk assessment and management package, enabling the safe and efficient operation of thermal fluid systems and legislative compliance at all times, via the creation of bespoke improvement plans. 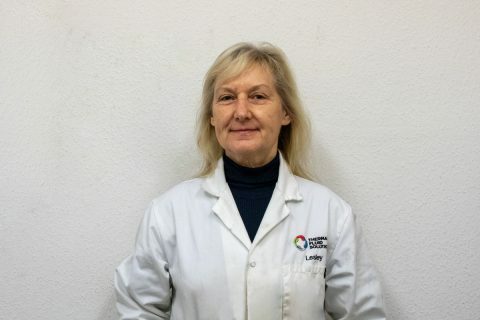 I run oil samples through a series of tests, log the data collected and then communicate it to our operations manager, Diana Clarke, who prepares a report for the customer. TFS is ISO9000 accredited and I regularly verify our laboratory equipment in order to guarantee quality assurance. Sometimes this can involve calibrating the apparatus myself or alternatively I may contract a specialist to do it. I also maintain our consumable stock of chemicals and equipment to keep the laboratory in operation. Originally from North Wales, I have lived in Buxton for over 20 years. I enjoy being outdoors, whether this involves gardening, walking or cycling; I hope to complete the Hadrian’s Cycleway in April. I also regularly participate in pilates and zumba classes. Christianity plays a central role in my life, and I am a keen member of my local church.